Mike Pence before a briefing on missile defense with Alaska Gov. Bill Walker and Gen. Lori J. Robinson, Commander, U.S. Northern Command and North American Aerospace Defense Command, in Alaska, Feb. 5, 2018. The Trump administration is leaving open the possibility of a meeting this week in South Korea at the Winter Olympics between U.S. Vice President and North Korean officials. Secretary of State Rex Tillerson, earlier in Peru, had used similar language when asked if Pence might encounter North Koreans at the sporting event. The vice president, in a hangar with an F-22 fighter jet behind him at Joint Base Elmendorf-Richardson, told reporters that if he met any North Korean officials he will tell them their country “once and for all” must give up its nuclear weapons and ballistic missile programs as desired by nations across the region and the United States. North Korea's ceremonial head of state, Kim Yong Nam, will lead Pyongyang’s high-level delegation to the Winter Olympics and is expected to attend the opening ceremony. Pence’s trip to Northeast Asia is meant to help counter North Korea’s charm offensive at the Winter Olympics. The United States is intent to not “allow the North Korean regime to hijack the messaging with their propaganda,” a White House official told reporters prior to Pence’s Monday departure. The vice president, in Tokyo and Seoul this week, will seek to intensify what the U.S. administration calls the maximum pressure campaign against Pyongyang to try to get it to give up its nuclear weapons and ballistic missile programs. This comes at a time of engagement between the two Koreas and reports of disagreement between Washington and Seoul on how to approach the North. “We’ve seen charm offensives by the North before and they have not ever led to any sincere movement towards denuclearization,” according to a U.S. official. Pence receives a briefing about ballistic missile defense systems on Monday at the joint base in Alaska during a re-fueling stop before heading on Air Force Two to Japan. In Tokyo, he will get a briefing at the defense ministry and meet on Wednesday with Japanese Prime Minister Shinzo Abe, who will host a banquet dinner for Pence. In Seoul on Thursday Pence will hold talks with South Korean President Moon Jae-in, with whom he will dine. 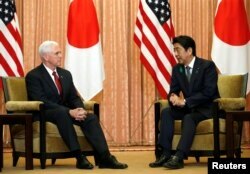 Administration officials say Pence’s discussions with Abe and Moon will be substantive, part of a pattern of the United States “remaining in extremely close contact” with allies about North Korea. U.S. Vice President Mike Pence (L) talks with Japan's Prime Minister Shinzo Abe at Abe's official residence in Tokyo, April 18, 2017. Trump spoke separately on the telephone with the Japanese and South Korean leaders on Friday, mainly discussing the situation with North Korea. Hours later, Trump hosted in the Oval Office eight escapees from North Korea. Pence on Thursday attends, as the leader of the official U.S. government delegation, the opening ceremony of the Winter Olympic games in Pyeongchang, South Korea. 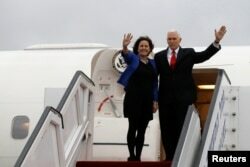 Others attending as official members of the delegation are Pence's wife, Karen Pence; Army General Vincent Brooks, commander of U.S. and United Nations forces on the peninsula; Brooks’ predecessor, retired Army General James Thurman; House Foreign Affairs Committee Chairman Ed Royce; Chargé d'Affaires ad interim at the U.S. Embassy in Seoul Marc Knapper; and 2002 Olympic figure skating gold medal winner Sara Hughes. Fred Warmbier, the father of Otto Warmbier, an American student who was jailed in North Korea and died last year after returning to the United States in a coma, will be Pence’s designated special guest at the opening ceremony. The sight of Warmbier alongside Pence will serve to “remind the world of the atrocities that happen in North Korea,” according to a White House official. The casket of Otto Warmbier is carried from Wyoming High School after his funeral, June 22, 2017. The U.S. delegation will witness South and North Korean athletes marching together under a common flag, displaying an undivided Korea. The two Koreas are to also have a joint women’s hockey team for the games. North and South Korea have no diplomatic ties and a state of war has technically persisted on the peninsula since a 1953 armistice brought to an end nearly three years of war that had the United States fighting alongside the South against communist forces backed by China and Russia. The Trump administration has repeatedly vowed to halt Pyongyang’s nuclear weapons and ballistic missile development, describing the programs as a serious threat to the security of the United States. “This is a matter of supreme urgency to the whole world” affecting the stability of the region and the world more broadly, according to a White House official speaking on Monday. Trump has belittled the North Korean leader as “little rocket man” and on Twitter boasted that his “nuclear button” is larger than Kim’s.